Introducing the First Mobile App from Chemo Duck – for Kids! Walk into most any pediatric healthcare setting and one thing is universal – patients are usually glued to some kind of electronic device. Twelve-year-old Gabe Sipos, the son of Chemo Duck’s founder, is no different. Except now, 10 years after spending countless hours in clinics and the hospital during his treatment of rhabdosarcoma, he had an idea. Chemo Duck has recently launched a series of free, entertaining and educational games and activities for kids fighting cancer around the world. The app is available on iTunes for use on all Apple phones and/or devices. “It was such a fun experience coming up with all the different ideas and aspects for the games,” said Gabe. “I really like the idea that in order to move ahead in the games, you have to earn a coin to unlock the next level. Phil Earnest, the app designer said he was impressed with Gabe’s vision for the apps. The app, Chemo Duck’s first, is an additional way for the nonprofit to impact the lives of pediatric cancer patients. In researching for the project, Lu Sipos said the market was ripe for a product. 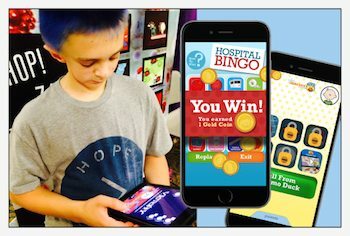 “I searched for an app to both entertain and educate kids living with cancer but couldn’t find one,” said Sipos. “When I mentioned this to Gabe, his face lit up. He was thrilled to develop one. “He has really found his place within the foundation. He has a way to give back,” she said. To download the app go to apple.com/itunes and search for “chemo duck” or click here to go directly to the Apple Store. Read full press release on PRWeb.